The "Conference" module provides an easy to use scheduler for Cisco UCM Meet-Me conferences and protects meetings by PIN or Caller ID. The Meet-Me conferencing is one of the useful features of Cisco Unified Communications Manager, but the common issue is that it is not secure enough - anyone who knows the conference number can dial it and join. With the "Conference" module you can protect Meet-Me conferences with PIN to be entered by anyone who wants to join the meeting. Each PIN is generated randomly and sent to meeting attendees after the conference is scheduled. In addition, you can create Meet-Me conferences protected by Caller ID. 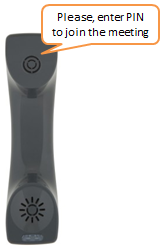 In this case the meeting only accepts incoming calls from the pre-configured list of phone numbers. Your employees will need to remember just one phone number for Meet-Me conferences. The system uses the PIN entered to join the attendee to the correct conference room. 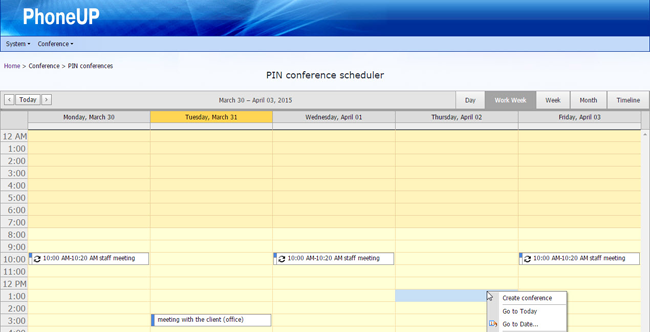 The "Conference" module allows employees to schedule PIN-protected meetme conferences using online calendar, or MS Outlook. Once the meeting is scheduled all participants are notified by email containing the PIN. The module provides the secured web-interface allowing meeting host to see the list of attendees and disconnect any participant. Cisco UCM Meet-Me feature requires Cisco IP phone to initiate the meeting before other attendees (mobile or 3rd party SIP-devices) can join it. With the "Conference" module you'll be able to start the meeting from any phone. Before scheduling a meeting the module checks the availability of conference bridge resources. If there are enough resources, the system will book them for the meeting, otherwise the meeting won't be created. Find out about Aurus U-Meet, enabling to schedule conferences in Cisco TelePresence environment and control meetings with the iPad app. The free PhoneUP promo license includes 3 ports for the "Conference" module. The promo-bundle is full featured and not time-limited.